Kaduri.net and “News First Class” were the only two websites to break the story – both are Hebrew-language-only. Perhaps the most highly esteemed rabbi of our generation had expressed faith in “Jesus”, the Messiah. Israel was badly shaken. Here’s the back story. 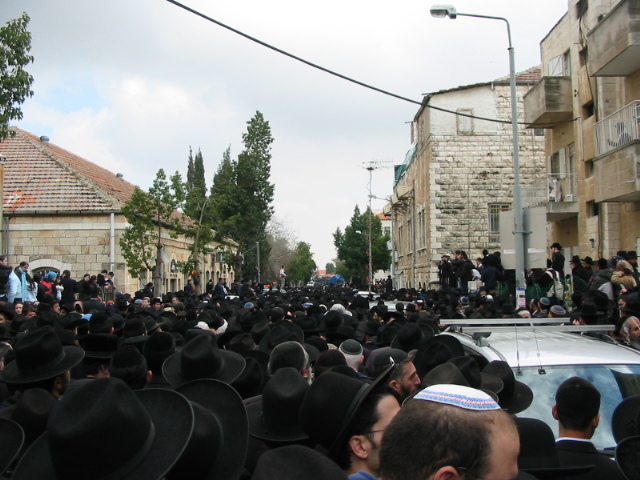 Rabbi Yitzhak Kaduri of Jerusalem lived at least 106 years — maybe 110. He was born in Baghdad to a rabbi and spice trader, but moved to the Holy Land in 1923, well before Israel was a nation. A genius who lived in poverty, he was a kaballist and a venerated scholar of the “Old Testament”. In fact, by mid-life, he had MEMORIZED THE TORAH— the first five books of Moses! Well before he died, he had memorized the entire Jewish Bible! He was considered to be a “TSADIK”: a Jewish saint (a potential messiah). People came to him from all over the world for advice, for blessings, and to receive prayer amulets which he made according to ancient kaballah traditions. He responded to every letter that was sent to him and he never refused to meet with anybody who showed up. Miracles are ascribed to him — also prophetic predictions. At least 200,000 (some say 300,000) people attended his funeral procession. 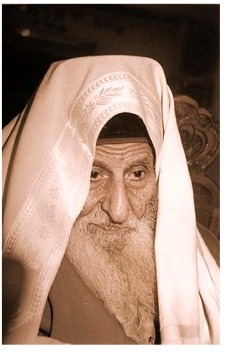 Rabbi Kaduri died in February of 2006. About five months before his death, the rabbi wrote something on a note and ordered that the envelope remain sealed until a year after his death. Everyone wondered about this, but his wishes were honored. When the note was finally read, it took the readers (all kabbalists) about 20 seconds to figure it out and go nuts. 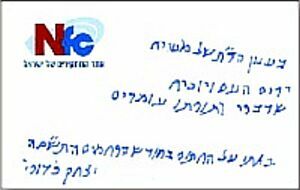 Here is what the note said, originally in Hebrew, of course. “He will lift the people and prove that his word and law are valid. I suggest that by adding the “ho” into the name of Yeshua, the rabbi was stating that this Man is actually the God-Man — in contradiction to the common Jewish expectation that every generation has a potential messiah who is a naturally-born man. Among the Jewish leaders who opposed the note as being a fake was the Rabbi’s 80-year-old son. Both the son and grandson have done a good job of marketing their family leader as an icon of ultra-orthodox Judaism, built a school on his good name, and — in many ways — have a LOT to lose should the rabbi be rejected as a Messianic heretic by the majority of Israeli scholars. Sadly, the son would prefer to qualify his aged father as being too decrepid to effect such a note. Being a brilliant man, but way too old to resist the will of his son, Rabbi Kaduri knew that he needed to effect a flawless strategy to keep his godless son from derailing the rabbi’s intention to proclaim the name of the Messiah. In Jewish culture, it is forbidden to speak ill of anyone for the first year after death. Rabbi Kaduri knew that the first year would pass with only glowing words of praise being spoken of him. Then, following this year, the bomb would drop. But after a year of untarnished veneration, how could anyone speak ill of him — just because of a note that was released? By waiting this year, should anyone speak ill of the rabbi, it could ONLY be due to their personal rejection of his realization that Messiah is named “Jesus”. It’s arguable that no one in the world knew the Jewish religion better than this man, so the fact that he had come to revere Yeshua of Nazareth left thousands in a state of stupefaction. In the yeshiva (Jewish religious school) that was founded around his life, the rabbi permitted his hand-written notebooks to be passed among the senior students. What is highly irregular is that there are over three dozen hand-painted crosses in the notebooks and all are known to have been painted by the rabbi. This is such a no-no in Judaism that even the plus sign is often replaced with another symbol to avoid using what could be considered the sign of Messiah’s Cross (David foreknew that Messiah would be pierced through his hands and feet while His enemies encircled Him — Psalm 22). Some of the rabbi’s crosses are large and ornate. Some are small. All are found on pages which deal with Old Testament prophecies of a suffering Messiah, sometimes referred to as “Messiah ben Joseph”. This is in opposition to the concept of the majestic King of the Universe, “Messiah ben David”. 2000 years ago, a carpenter named Joseph became the (adoptive) father of a son who was called Yeshua ben Yossef. But ancient Jews wrote about the Messiah coming into the world on parallel with the Joseph found in the book of Genesis — born the favorite son, one who foresaw the future, hated by his Jewish brethren, harmed, enslaved, and thought to be slain, yet revealed to his brothers as being the SECOND most powerful person in the world — the one who had saved them all despite the fact that they had not known it. This is one of the Old Testament’s many “prophetic types” which points to the first ministry of Messiah. Believers all over the world confess Him to be the Redeemer — the “Last Adam” who did everything necessary to win back Creation from the grave. Lord, bless Rabbi Kaduri who has spoken shouted from beyond the grave! Very well written and illuminating. Thank you for posting it, and for dumbing it down for the rest of us. Hi, Can I quote you on my youtube channel? I uploaded a video regarding Rav Kadouri and found your blog story on him. It was by far the best info that I have found on this note that he left! PS i already started using your info and then it occurred to me that I better ask you for permission..
Sure. Am sorry that did not see your comment and reply sooner. God Bless you. I suspect that many Rabbi’s have come to the conclusion that Jesus was and is the Messiah. However, it would take much courage and much humility to declare their past error. I say this not in condemnation but with much sadness Jesus was the “Root and the Branch” of David, just as the prophets declared. Blessed is He who came and shall come in the name of the Lord YesHWH. God bless Rabbi Kaduri for his courage. Thanks for the word, bro! The rabbi had an impact on the Jewish community, no doubt. Of course, that information was muted / censored very quickly. One man’s testimony can be quashed, but the Word and the Lord’s Will can never be contained. It will take real trouble and pain for the Jewish community in general to capitulate to the Risen Messiah. Likely Persia will have a lot to do with that before the end of this age. We see the players gathering around the “apple of God’s eye”, preparing to pluck her out. Very exciting times! Without the proper degree of pain, a “good” rabbi does have a lot to lose. I knew a man named Michael who converted to evangelical Christianity. His family had a little funeral for him. He called his mother a year later and she responded, “Michael is dead; please do not call here again” and hung up. A few years later, both she and his father came to Messiah — kicking and screaming. Ps. 22 and Is 53 are such key passages, as is Abraham’s offering of Issac. But Yeshua ben Yosef is on every page of Genesis — I love the life of Joseph especially. The brothers do come on their knees and the dream will be fulfilled. Jews need their community more than any other ethnos. They get hunted down every generation by non-Jews, so it’s understandable that they have a real need for Jewish fellowship. Only the Spirit can overcome that physical need. My deepest concern is that the Church and all missionaries will go to the Jews primary — and then the Gentiles. This is the express desire of the Lord. And the Church (in general and for centuries) is NOT doing it. Rabbi Jon Bernis seems to be doing great work to change this now that the end is nearing. Very exciting times! ‘Rabbi’ Bernis is not a rabbi…’Messianic Jews’ are not rabbi until they got their smichah in authentic orthodox Jewish way. A rabbi acknowledges the Oral Torah and as far as I understand most ‘rabbis’ in MJ do not and even oppose it! Other than that the Church should most definitely NOT go on mission to the Jews! The Church has a very twisted message for Jews, which is why they become Christians and leave the authentic Jewish Torah way of life. It happens a LOT! Rabbi Kaduri, zt”l never became Christian, because believing in Yehoshua as Moshiach ben Yosef is a Jewish thing. Not a Christian thing, not a typical ”Messianic” thing, not a ”Jews for Jesus” thing. All these groups only share half truths and there have been way too many Jewish (and gentiles too) people that were ripped away from Jewish life in and never returned. I admit that these ways might be a start for a Jew who was an atheist or some other non-Jewish thing, but after that, it should always lead to a fruitful Torah life and that includes Oral Torah as both Yehoshua and Shaul/Paulos testify. In churches and the lion’s share of Messianic Congregations this is NOT done. Moshiach reveals Himself also and G-d works His way, He is mercyful to every single Jew (and gentile!) who has never met Yehoshua, but only ‘Jesus’….still a long way to go! Christianity is NOT the way for a Jew. G-d rest Rav Kaduri, zt”l his soul for this revelation. OK. I am assuming that your heart is right toward the God of Israel and His People, the Jews. I disagree with you less than you might assume. I’m no expert on the proper installment of a rabbi. Most of what I have learned of Judaism is through Edersheim and Ginzberg, although Josephus, Rambam, Ramban, and Breslov helped after the initial Edersheim foundation was laid; I found that those scholars who wrote in discord with the traditionalists put unique light on the normal interpretations. Rambam taught to change the most sacred text of Scripture from echad to yachid! But, No Rabbi, Sir, the text remains: “Hear, O Israel, the Lord . . . is a union of similar yet distinct individuals who cannot be separated (echad) — not isolated singularity.” Rambam’s was/is the kind of heretical teaching that gains traction when a good Jew refuses to follow The Good Jew. Yes? On the other hand, given the Spanish Inquisition, I can really sympathize with why Jews might avoid the “church”. I am one member of the Church and I do not have a very twisted message for Jews. I cannot speak for anyone else. Ala David Levine (Rabbi? ), I perceive that proper Messianicism causes a Messianic Jew to value that status more highly than does any other system. Rabbi(?) Yeshua ben Joseph [not sure if his bar mitzvah questioning in the Temple was satisfactory for you or not so as to validate the ministry of his life] was not shy about His disagreement with the Oral Tradition that a little monster (Bat Melech) lives on your hands and must be wasted off in the prescribed manner of the “elders”. Jesus clearly stated that this part of the OT was garbage. Are you going to tell me that Bat Melech is real and needs to be removed in the prescribed manner of the Oral Tradition? I will stand with Messiah on that point and consider the OT for what it is: valuable, but non-canonical. Consider http://jiminmontana.com/2011/04/30/modern-jewish-thoughts-on-messiah/ and how the properly-installed Rabbi who wrote the book makes hash out of Zech. 12 by leaving out portions of the passage that could possibly be construed as speaking of Yeshua. That 36 saints exist in the world which keep the God of Wrath from destroying us all — any one of which is a candidate for becoming the messiah even though they each have had less than flawless lives under the Torah! This author is a good Jew without The Good Jew as his Head. This is the kind of trash that you are arguing for by attempting to deny Jews the New Testament revelation of Who the Messiah is and is to come. Or did I miss something? We will agree that Replacement Theology is NOT the way to go for any Jew (of gentile). But, since that is heretical for the Church, the statement goes without saying. I will admit that some aspects of the Plan of G_d o not make sense to me. I just have to get with the Program without full understanding. I read Galatians and think along certain lines regarding Jewish customs, then I read in Ezekiel 46 that the Temple to come will be open only on Shabbat and New Moons. My Goy head explodes at the contrariety. I hear your concern and I infer that you want the best for the Chosen. Would you please go to my top post, go through that message, and get back to me? Besides that it’s interesting and quite telling that the famous ‘Yigdal’ prayer from the Jewish prayer book is speaking of “ECHAD” where Rambam speaks of YACHID in his 13 Principles of Faith. Yigdal was finished some 200 years after Rambam had passed away by Daniel Ben Yehuda Dayan, a liturgical poet from Italy. It shows that Jews following the teachings of Rambam NEVER considered G-d as anything other than ECHAD when it comes to His nature. Also for example, in a Sephardi and Arab siddur I own, the 13 Principles of Faith state also ECHAD as 2nd point. Last but not least it’s not weird at all to call Hashem G-d also yachid, as that word shows His uniqueness, His being alone. Furthermore G-d’s Being is a mystery and we will never know how He exactly is. That’s why He said He is ECHAD, One. Also Yehoshua and his disciples and others affirmed this Jewish faith. Mashiach only fully shows the grace, splendor and qualities of G-d, which is why he is called the ‘Image of the INVISIBLE G-d’. Christians always claim boldy how unfathomable G-ds ways are, but when it comes to the core of His Being, they catch Him in their formula and tell others, in their eyes heretics, that “Only the Spirit can reveal the truth of ‘The Holy Trinity'”. You sound a little cynical to me (‘not sure if…satisfactory for you’). In that time the term rabbi was not yet a legal title, but used by scholars and laymen to address very learned Torah teachers. So yes, Yehoshua was a Rabbi in that way and was also addressed by Pharisees like that. His ministry was ordained by Hashem, by G-d.
As the New Testament shows, Yehoshua and most of his pupils upheld the tradition of netilat yadayim (washing of the hands). He did not at all say anything negative about it. In fact he didn’t even say anything about this practice at all (although most christians say that he did)! The little, obscure tradition of Bat Melech is part of aggadah (the non-legal part of e.g. the Talmuds as opposed to halacha (legal, law)) and made up of parables, myths, stories, legends, etc. It might be that the rabbi(s) that came up with this story wanted to make a point, to explain the halacha of ‘washing hands’. Western-Christian (and even many -Jewish) people often don’t grasp the way that the rabbis spoke in those days. It was the Middle-East and in that area (still) faith and religion are full of stories and traditions that use extreme language to make a point. Bat Melech, not sure, might be just that, whether you like it or not. It was about ritually removing evil from the hands, especially after waking up (because night time is, as you hopefully acknowledge, the time for darkness, evil, etc.). When claiming that the Jewish practice of washing hands to cleanse from some spiritual evil state is bad or stupid, superstitious nonsense, then you might as well say that the immersion (“baptism”) into water to ritually get rid of the ‘old (evil) self’ is superstitious nonsense! But of course it’s not! However it may be, I think it’s quite a thing to say you “stand with Messiah on that point” stating that Oral Torah is only valuable but nothing more. That’s not what Yehoshua taught the people! He taught that they had to obey everything the Pharisee teachers taught (Mat.23). He was talking about Halacha, legal rules, not aggadah in particular, because Aggadah is something that can very from teacher to teacher, but is definitely very important! Aggadah might sometimes be superstitious (and yes, specifically Bat Melech MIGHT be that and in some Hasidic and Arab-Jewish circles it became just that and even surpassed regular halacha). You have to realize the difference between halacha and aggadah when it comes to Oral Torah. When you can’t tell the difference, you better not claim that it’s just valuable and nothing more. The Torah that was written (Gen-Deut) clearly states how Oral Torah (rules, interpretations, etc.) was established and that is why Yehoshua told the people to obey the Pharisees and THEIR (so not the Sadducee) scribes, because they were in the legal position of the Judges of Torah (“Seat of Moses”). By the way, maybe the Bat Melech tradition wasn’t even around yet when Yehoshua walked the land. It’s too obscure to even tell when it originated. I sense some kind of cynicism again (‘properly installed rabbi’)! That a rabbi is properly installed does not mean that he is the perfect human being, the one with the full truth, etc. Human beings make mistakes, also rabbis. Why I made my statements about ‘Messianic rabbis’ is because they are FAR from the Jewish faith and traditions, oftentimes very close to Christianity. Why in that case would you want to insist on being called a rabbi? However, that’s not our case here…I read the piece about Rabbi Jacob Immanuel Schochet, z”l. I happen to have the booklet and also some other books by his hand and they are really interesting. Once you dive deeper into the concept of the tzadik you’ll find out that it fits Yehoshua perfectly in many a part. It even speaks somewhere of being ‘sinless altogether’ (familiar?). According to Jewish tradition THE Mashiach is the Ultimate Tzaddik and thus definitely one who suppressed His evil inclination to point zero (i.e. sinless). It clearly says that this Immanuel will have to learn to reject evil and choose good. It’s a process, which SEEMS to mean he could not have been sinless throughout his entire life. That’s not a little detail, it’s quite a huge thing. I know this. It’s also part of this aggadah, not halacha. I must say I’m no expert in this particular part, so I can’t fully judge it. I do have to say that there might just be tzaddikim for which G-d does not destroy the planet, but if it’s 36…I really have no clue and as long as I don’t have a clue, I don’t actively support the view, nor do I say it’s untrue. It’s just a grey area of which, thank Goodness, there are many. We don’t need to know everything. You don’t know me, so I can safely say you did miss something. I’m not at all denying Jews the NT…I’m just saying that a LOT of work is in progress and that basically christians (and most Messianics) are not the ones to missionarize Jews. Jews are in G-ds hand and Mashiach shows himself to them. The Church should work on itself, because it’s been an anti-Jewish and pagan institute in too many things and almost ALL attempts to bring Jews to believe in Yehoshua as a Messiah have failed. How do we know? Because the lion’s share of Jews that started believing in Yehoshua became Christian and adopted Christian doctrines and traditions and focussed on ethnical Jewishness. A logical thing when not living how a Jew is supposed to live. Fortunately the movement that calls itself Messianic Judaism has individuals that are Torah-true, that is orthodox like other (mainstream) orthodox Jews. That is how it’s supposed to be, like Yehoshua and also Paul and the others taught. Accepting the principle of Oral Torah does not mean accepting anything and everything that’s being said by the rabbis when it comes to their stories, parables, etc. However usually it’s used to tell a significant message behind a text or law. Don’t live too narrow, Jim. Within the context of Hashem’s Torah and Grace is more room than you think. You don’t have to agree with me, I’m not here to agree. Neither one of us has the only and full truth! Just know that G-d said that the Torah was given to humans, not angels and is was given on earth, not in heaven. Interpretations and traditions are a sign that the Torah in principle is a Living Organ which is why Yehoshua could be called the Living Word! There will always be things, for everyone. What about this one in Ezekiel 45? Well, G-d bless you through the Lord Yehoshua, Jim. You said that you would need some time to reply — that makes sense now considering your considered response. My tidy systematic theology has been getting cracked by several verses of holy writ which will not allow for a traditional Christian understanding. Isaiah 66 and Hebrews 8-10 have been iconoclastic. Rabbi Kadori no doubt was a brilliant man and to have the privilege to speak with Yashua for a year must have been a blessing but yey saddening for him knowing that his brethren would harden their hearts to the message . No doubt the good rabbi was a scholar of the new testament and knew Satan comes first acting as Jesus . I fear many of our Jewish brethren will fall prey to Satan , not unlike most Christians . There are many troubles in this world, but the Lord is able to make those stand who Trust in Him. The Gates of Hell cannot prevail. Only stand your ground in the Stregth of the Lord, and resist the Evil One — and he will flee from you! And that legacy depends on where u stand! I am a Jewish believer in Jesus and former Orthodox Jew. I’d be happy to email you my Testimonial if you would like to read about my journey. Many blessings to you! Jim, Is there a reason my comments have not appeared here?